A man has pleaded guilty to assaulting disabled pensioner Alan Barnes, for whom more than £300,000 was subsequently raised in donations. The 67-year-old suffered a broken collarbone when he was knocked to the ground outside his Gateshead home on 25 January. An online appeal set up on his behalf raised £330,135. Richard Gatiss, 25, from Gateshead, pleaded guilty to assault with intent to rob at Newcastle Crown Court. 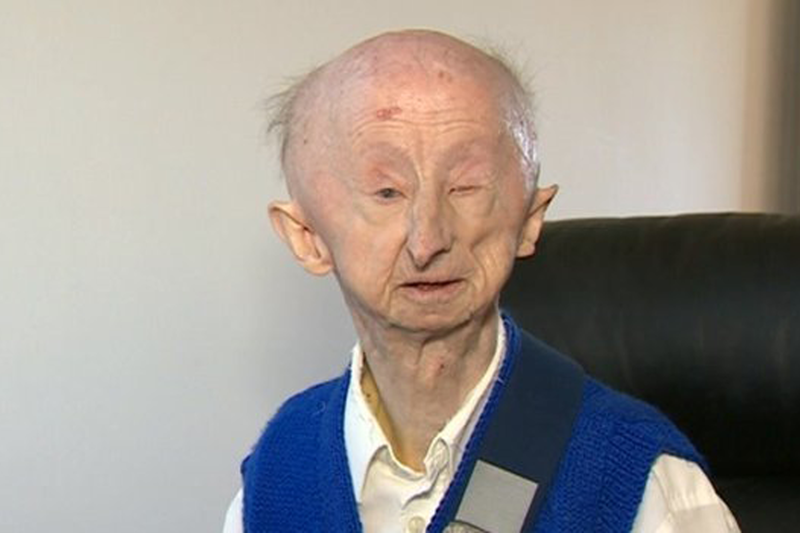 Alan Barnes is the vulnerable pensioner from Gateshead who was overwhelmed by the kindness of strangers. The 67-year-old is easily noticed. He is well known in the area where he lives. He has a range of physical disabilties because his mother contracted German Measles when she was pregnant with him. When one local woman heard what had happened to the 4ft 6in gentleman who lived near her, she did something about it. Katie Cutler set up an online appeal to raise £500. The appeal went viral and in a matter of days the total raised reached £330,000. The two of them first met and hugged in front of reporters - surely one of the most heartwarming images of the year so far. As for the man who attacked him, he now has the notoriety of being the villain responsible for a despicable crime. Richard Gatiss cut a sorry figure when he appeared before magistrates. He sat weeping in the dock as the court was told his DNA linked him to the assault. He will be sentenced at a later date. Newcastle Crown Court heard today that Gatiss is "shocked, horrified and deeply ashamed of what he did". He is also conscious of being in the public eye the judge was told. Mr Barnes was putting out his wheelie bin when he was attacked by Gatiss. Moved by Mr Barnes's plight, an online appeal to raise £500 was set up by Gateshead beautician Katie Cutler. It attracted donations from across the globe and quickly passed the initial target. Mr Barnes was presented with the cheque earlier this month. He intends to use the money to buy a new home as he does not want to return to the area where he was attacked.